You are currently browsing articles tagged business. Throughout 2017/18 we are hosting open afternoons to introduce university colleagues to this amazing source material as inspiration for cross–disciplinary research and other activities. Each session will include some lightning talks that draw attention to some of the ways ephemera are being used to support research and scholarship. The main purpose of the sessions, though, is to encourage dialogue and inspiration for research bids. In the Typography Department, ToB2 at Earley Gate. We begin with some lightning talks that draw attention to some of the ways ephemera are being used to support research and scholarship. The main purpose of the sessions, though, is to encourage dialogue and inspiration for research bids. Joe will outline how he is using ephemera (aka material culture…or ‘stuff’) to analyse 500 years of urban development in central Reading. He will illustrate his short talk by reporting on the role of Sutton Seeds’ Annual Farmers’ Year Book in shaping the development of the Royal Seed Establishment in Market Place. Nicola Wilson, Lecturer in Book and Publishing Studies, English Literature will talk about using ephemera’/business records in the publishers’ archives. Conceptualising a building as unfinished and always in making highlights the ephemeral nature of architecture. An approach to study the uses of a building, which foregrounds the practices happening within that building, is then faced with a methodological challenge of locating the fleeting building. It is here that the ephemera becomes a very valuable dataset. Experiences from two research projects will be discussed, which explore the ephemera from the University’s Special Collections. The first project is my doctoral study on the adaptations of our 50-years old library building at Whiteknights Campus. The second project is around the DEGW archive which explores the role of physical built environment in organisational practices. Michael Twyman, Director of the Centre for Ephemera Studies, will discuss examples for invoices and trade cards from the ephemera collections. Seminars are open to all academic staff, PhD students, and other students on certain degree programmes. Lunch is provided. 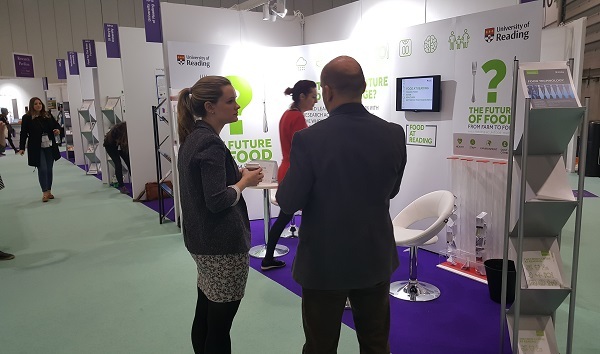 Food businesses and the public were given an insight into the research capabilities of the University of Reading in agriculture, nutrition and health at the Food Matters Live 2016 exhibition. The exhibition took place at ExCel, London, from 22 to 24 November last year. The event showed Reading’s world-class food science facilities and research capability, while the University asked visitors to their stand to share their future food challenges. Better for the environment – by understanding the impacts of the whole food chain, from farm to fork and beyond. Climate change is never far from the news headlines – but often it’s not because of the science. As much as I think that complicated mathematical calculations about the circulation of air and water around the globe should make people stop in wonder, I fear my beliefs are not widely shared by most other people. And they would have a point. Most people don’t talk maths over the water cooler or when down the pub, beyond adding up the cost of their drinks. So if it’s not the science, what makes climate change so appealing to journalists? Often, it’s the politics. News media love to observe a good old-fashioned fight, and politics is the arena where disagreements get aired every day. Not only that, but politics tends to have a bearing on how we live our lives, too. So while the basic facts of human-caused climate change are agreed by just about all scientists working in the field, a handful of doubting politicians often hog the headlines.